One of the first tools of our kind was the needle. History of sewing starts over tens of thousands years ago. They even talk about 28000 B.C. India in around 1200 B.C. produced iron needles. But the modernity of sewing begins with Leonardo Da Vinci. The first factory was built in Germany in mid 18th Century. It's a cool thing know about sewing, you can fix things about your apparels or you can even make a new clothing for yourself. Even they tell it's almost impossible to make one for yourself 🙂 Now ALDI has got the modern machines for you. They have lowered prices for Mothers Day. 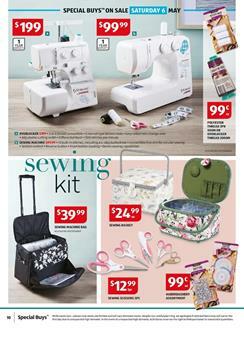 Sewing basket, Mannequin, cabinet and more products are featured on pg 10-11. They are on sale on 6 May Saturday. Shop for sleepwear for ladies on Saturday. They got pyjama sets, water bottle, slipper boots, massage chair and more products that are viewable on pg 12-13. Go to these pages to see details about the products. Shiatsu Massage chair features heating function. It's really comfortable to use in Winter. 1 Year warranty comes with this product. 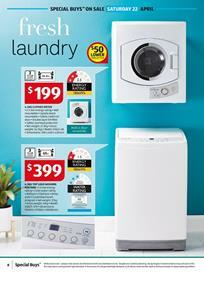 Shop for that one for only $249 at ALDI stores this weekend. ALDI's Winter Gear sale might begin soon. Last year they had a winter gear catalogue in May. So follow the page of ALDI Catalogue to get future posts and news about any possible sale. View the latest product range of ALDI that consists of home appliances, small electronics that makes your life easier, general household supplies. ALDI offers air compressor and previously we posted a descriptive post about that product. Besides they offer a good range of power tools that would be essential for any kind of DIY project. You should low prices of this catalogue to save more. Instead of getting these products from a warehouse, purchase them at ALDI to get them cheaper. Check out the post of ALDI Air Compressor for professional tools, work wear, small accessories to simplify everything and more. Meet the new sale of ALDI Catalogue featuring elder care products which will help senior members of your family a lot with their daily struggles. Really good offers are featured. For example rollator walker is only $89.99. Also gardening sale of ALDI look really interesting. New deals for decorative products, chainsaw, petrol hedge trimmer, and hand tools to make everything easier are featured. You will pay $40 lower for foldable wheelchair this week. Shop for these products on Saturday. Developed technology for disabled ones are featured on pg 10-11. Cool prices and comfortable design of these products will make this shopping really fun for you. Shiatsu back massage cushion and toilet frame which can be folded are available in the list of products on pg 10-11. Take a look at the new sales of ALDI Catalogue for gardening products on pg 12-13. This week's (special buys week 10) Satuday deals are consisting of cleaning supplies and appliances (including vacuum cleaners), care care products for cleaning and protecting from outer effect. In the cleaning supplies of this Saturday special buys range, you will find regular products for cheaper prices. You got only one shot. Saturday is the only day you can shop for these products. Check out some of the good deals on pg 10-11 in case you find something way lower than your regular store. Indoor premium broom is a perfect one especially when you need a lot of water with soap to clean your balcony or terrace. Its price is only $8.99. Another good deal is Magic holder on sliding rail priced at $9.99. 2-in-1 cordless vacuum cleaner is a easy-to-use, low priced and really effective product. Such a product would be sold for over $120. ALDI got a special price for you. You can detach its vacuum to get dirt on coach or something. ALDI price is only $99.99 for this vacuum cleaner. These products are essential if you do your car maintenance or cleaning yourself. If you take your car to a car wash each week, still some products might be useful. For example, Wet/Dry cordless vacuum cleaner (review video of ALDI) could be great to clean if you have some dirt, crumbs on seat or under seat. Don't waste time every time you see defects. So you can find also compressor, support stand and more in case you got stranded. Check out other products that are on sale on Satuday 11 March. Three different groups of products are available on ALDI Catalogue are on sale tomorrow. See all the products of special buys catalogue on pg 10-15, which are the products you can purchase on Saturday 11th February 2017. Some beauty products are featured inclusive of polish remover, nail polish, pedicure systems. Business wear of ladies are also in the list of ALDI for special buys. Pants, leather pumps and stocking are featured deals and more can be seen. Remake your garden with the products you can get for lower prices of ALDI Catalogue on pg 14-15. 2400W Electric blower vac is a fantastic tool to get rid of all your unwanted leaves. 30L collection bag will allow you to clean for a long time. You can strap it to your shoulder and start blowing easily. 140cc petrol lawn mower features 4-stroke briggs and stratton engine. It's deck is completely made of steel which means you have no problem of damaging your machine. 3 year warranty comes with this product. Its price is only $299 at ALDI this Saturday. Check out suit sets, shoes and more products on pg 12-13.